A broody hen is a hen that has decided to sit on her nest (with or without eggs) and will not leave the nest at all. 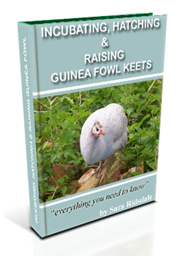 The term broody means having maternal instincts that make the hen want to hatch her eggs. 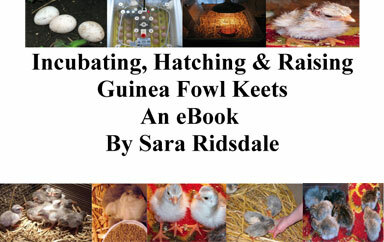 Broody hens can, if left sitting in a nest box, suffer from a loss of body weight and egg production. Location of the nest box is very important when a hen decides to sit because the other hens in the coop could attack the sitting hen or take over her nest. Parasite control is important when a hen is sitting, so applying a parasite product to the hen is a good idea. If you wish a hen to sit on a nest of eggs then make sure that the nest site is comfortable and away from other hens. If the hen has to be resited, try to remove her from the nest as soon as possible, but preferably at night so that she has time to settle in the new site. Sometimes it is necessary to use pot and plastic eggs to encourage a hen to sit. 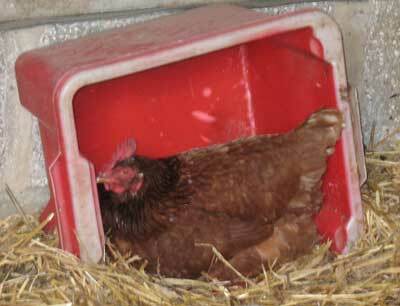 A good site is a darkened, well ventilated nesting box where other hens cannot disturb the hen. Food and water must be readily available and easy to access. If you do not want to let a hen sit on a nest, then it is a good idea to remove the hen from the nest as soon as possible (night time is a good time to do this). Sometimes it is necessary to put a broody hen in a broody coop. A broody coop is a small cage or box which has a wire or slatted bottom to discourage the hen from sitting in the coop. A broody coop can be suspended from the ceiling of the poultry hut so that the hen is not removed from the other hens completely. Food and water must be provided in the coop. After a few days the broody hen can be returned to the rest of the flock. I have hens that go in at night and free range during the day, sometimes they will roost in trees if I have not let them in their hut soon enough, although I don’t like to think of them outside as I worry about predators (we get foxes around us) and as you say the weather. My first hen Hatty would go into the tree in the orchard and I have been known to climb a ladder to get her down but wouldn’t recommend this if they are very high up. If they are high up they obviously feel safe and the weather presumably doesn’t bother them. Hope you get your hens sorted. I have 8 completely free range chickens that happily roost at night in their coop. About 3 weeks ago the door blew closed during the day and they were unable to get in at dusk.When I went to lock up, 6 were waiting by the door but 2 were roosting 15 feet up in an ash tree. Since then, they continue to roost in the tree – no matter how much I try to persuade them down or how awful the weather. Are they OK up there or should I try to get them back in the coop and if so, how?? also has sometimes very large poop she eats laying crumb and oyster shell and popcorn on movie night.these siqns are scaring me i thought she was sick but she is well well healthy so it cant be that.HELP ME PLEASE. hello,my one yr old hen buzz buzz is a silkie.she is a house pet in a cage who gets let out daily.she lays eggs and we take them out as soon as we see it.for 4 days she has stayed in her sleeping spot in her wired bottom cage and sleeps.she wont come out some days but when i get her out she is fine.she eats and drinks fine but when you go to her cage she puts her tail up and makes a sound.i thought she was egg bound but no pain or egg i did not know about broody hens.this is my first chicken i raised her from day two.please some one tell me what this is.she sleeps daytime and wont move but to eat or drink.when out of cage she is fine.but picks at tail feathers and other feathers what going on. I don’t have experience of hens hatching chicks with a cockerel and other hens around but I would advise that you move the other hens and cockerel. The other hens and cockerel may not like the chicks and could try to kill them ( not always the case). If you move the broody ehn then she may not sit on the eggs, so I would move the others if that’s possible. I would make sure that once the chicks hatch that the other hens and cockerel can see the chicks and hen so that when you put them altogether they will mix ok.
Good luck with the hatch and let us know how you get on. Can someone help me please? We have 3 hens and a cockerel. Unfortunately one of the hens has gone broody and is sitting on her eggs, All 4 live in the same coop at night (omlet). I need to know what I should be doing. do I need to move her to another run and coop? if I leave here where she is with the others, will them effect her hatching them, if not will they attack the chicks?? ONCE THE CHICKS HATCH, HOW LONG CAN THEY BE KEPT IN THE FENCED IN AREA SINCE THEY WILL NOT BE ABLE TO GET OUT OF IT ON THEIR OWN? WE CURRENTLY HAVE 16 (1 TO 2 YR. OLD) FREE RANGE HENS (BUFFS, LEGHORNS AND ARACANAS (SP? ), A GUINEA HEN, 2 CAGED MEAT ROOSTERS AND 11 7 WK. OLD LEGHORNS (5) AND GOLDEN COMETS (6) IN A PEN. WILL THE OTHER HENS ATTEMPT TO HURT OR EVEN KILL THE CHICKS ONCE THEY ARE OUT OF THE SAFETY OF THE FENCED IN AREA? SHOULD THE CHICKS BE SEPARATED FROM THE HEN AND BE PENNED UP UNTIL THEY ARE OLDER? WILL THE MOTHER “HAVE A FIT” IF THIS IS DONE? WILL THE HEN NEED TO BE KEPT SEPARATE FROM THE OTHER HEN FOR SOME TIME PERIODAFTER THE CHICKS HATCH? Thanks for visit farmingfriends and leaving a comment. 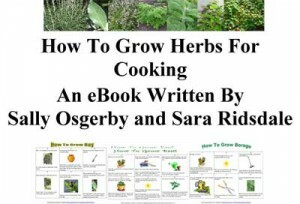 You could leave them to it and the hens would sow the chicks how to feed and find water. If they have finished hatching all the eggs then you can move the hens and chicks to a safe coop so they can have access to water and food. I think I would make sute that the safe coop had a run area attached so the hens and chicks can roam about but would be safe in the encloused environment! What breed of hens are they?